If you’re looking for more information on prospect research, this ultimate guide is a good start. But if you’re looking for a discussion of wealth screening and its definition, stick around. Willingness gets into the realm of philanthropic motivators, charitable interests, relationship to the organization at hand, and other factors such as those. A donor’s willingness to give will not always correspond with that donor’s capacity to give. Wealth screening helps nonprofits determine donor giving capacity. Generally speaking, wealth screening takes what financial information it can find on a specified donor and figures out how much that donor is able to donate. You could have a prospect with a ton of expendable income and little interest in making a charitable contribution. You could also have a prospect with the drive to give who lacks the funds to do so. In order to get the entire predictive picture of a prospect, you need both sides of the equation. That’s why a well-rounded process of prospect research is so strongly advised. Wealth screening stands as a pillar for prospect research. It cannot be relied on as your sole method of research, but it will lead fundraisers in the right direction. When looking for high-quality donor candidates, giving capacity cannot be ignored. Those screening prospects for wealth will analyze a diverse array of data in order to uncover the most accurate and representative projection of a prospect’s financial situation. These provide a window into a prospect’s financial situation and can often even reveal a certain willingness to donate as well. Political giving and real estate ownership, in particular, have positive correlations with philanthropic giving. For instance, a donor who has given more than $2,500 in FEC and charitable donations is 14 times as likely to make a philanthropic donation as a standard prospect. Most high net worth individuals are not going to come out and reveal their finances because you ask them to. Your researchers will have to be savvy with how they acquire their information, but effective wealth screening can have a massive impact on your nonprofit’s handling of its high-quality donors, from acquisition to stewardship to retention. What are the limits of wealth screening? What types of organizations perform wealth screening? Wealth screening, as a subset of prospect research, can be handled in a multitude of ways. Each option has its own merits and needs to be selected based on a variety of factors, such as organizational budget, size of the prospect pool in question, and the desired frequency of the screenings. When a wealth screening is performed, the researchers are looking for that magic number — the giving capacity. Getting accurate and reliable numbers will take a combination of resourcefulness and ingenuity, but the help that the research gives fundraisers cannot be overlooked. An effective prospect researcher and fundraiser pairing can be a real dream team — the researcher with the pass and the fundraiser with the alley-oop. With the data a wealth screening can provide, a fundraiser can feel confident in his or her ask. The two can be partners in solicitation strategizing. Maybe you’re thinking, math…ugh. Or, math…yay. Math…meh? Whatever your feelings are regarding math and formulas and equations, they are a crucial part of the predictive process of wealth screening. So, you know about the property your prospect Jack owns. You also know about his political giving, his stock ownership, and what he gave to another local charity last year. What does a wealth screening do with all of that raw information? Well, the data is run through different formulas, all depending on who is researching for you and how they’re researching. The 5% over 5 years equation is oft cited and oft used. With any of these wealth screening results, you have to be aware of the fact that in the end, these numbers come down to estimations. There are ways to improve accuracy and certainly better researchers than others, but without the balancing effect of simultaneously considering philanthropic data, wealth screening reaches a limit. Wealth screening is hugely beneficial and certainly recommended, but it does have its limits. It alone cannot predict a prospect’s true likelihood of giving. Myth: Wealth is the best indicator of a major giving prospect. Fact: Past giving is the best indicator of future giving. Start with philanthropy and supplement with wealth and your nonprofit will be in a much better place for it. Don’t waste fundraisers’ precious time with making a big presentation and ask to a prospect who has no interest in donating. Once you know a prospect has strong charitable motivations, you can then use all of your wealth screening data to design the best solicitation strategy possible, but your prospect research should always lead with philanthropic indicators. The answer to this question will be much like the answer to this same question in our breakdown of prospect research’s definition. Wealth screening, especially because it is a subset of prospect research, is performed by all of the same organizations that use the umbrella method. With wealth screening in particular, nonprofits seeking new major gifts and planned giving donors are well-suited to taking on the process. When performing a wealth screening, as long as your organization is diligent in its efforts and aware of possible limitations, you’ll be incredibly happy with the results. 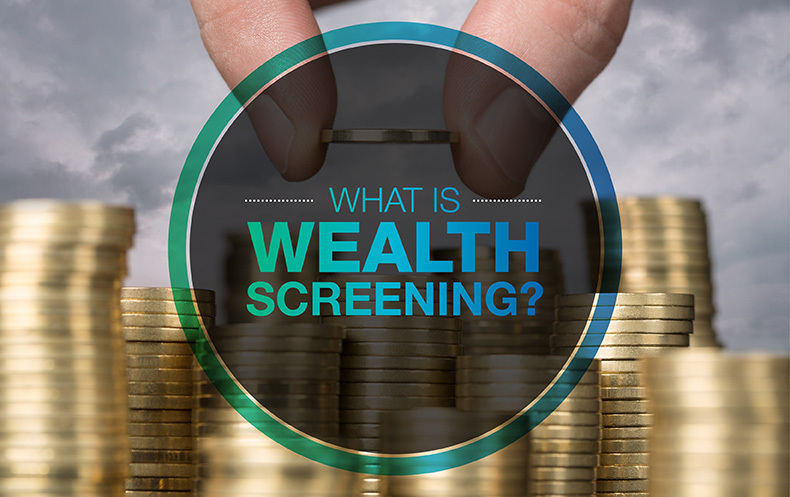 For more information on wealth screening, check out the definitive guide.